I’ve got some excellent news! Last year, my friend Gina put a call out for help on behalf of her lovely tortie named Snickers. She needed assistance raising money for an expensive and much-needed surgery Snickers needed. I know how hard it is to admit when we need financial help, let alone ask our community for that help. Gina’s no different. She stated that she wished she had something to give in return, and that’s when I designed a pattern just for her to give out to all those who donated to her kitty’s kitty. 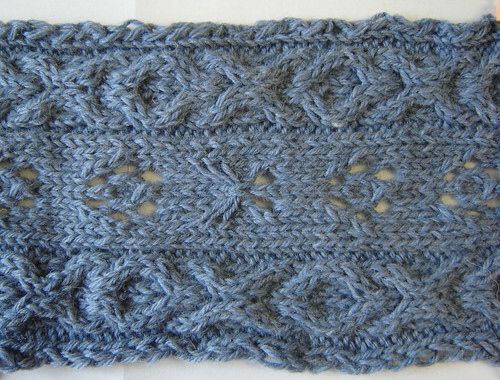 The scarf calls for approximately 3 balls of worsted weight yarn, knit on US size 7 [4.50 mm] needles. Hugs-and-Kisses cables flank a center of cat-face and cat’s paw lace in this sweet bit of whimsy rolled up in a scarf that celebrates all those wonderful things that make our cats the adored and treasured creatures they are. Linky for Ravelers. Otherwise, either click the button below, or go to the Dizzy Blonde Designs page and scroll down. You want to knit it, you know you do! Thanks for making this free. 😀 Have a nice spring weekend. So cute! Good job, you do-gooding good doobie, you. It’s a really cute scarf too. Everyone knit it up!